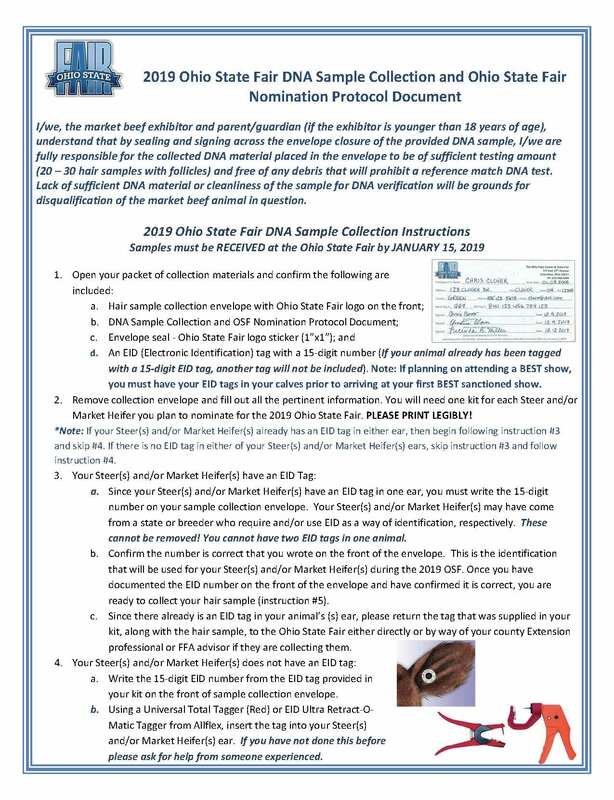 The Ohio State Fair requires all market beef entered in the 2019 Ohio State Fair to have individual DNA samples taken from each animal that may potentially be entered. These DNA samples must be in the possession of the Ohio State Fair by January 15. Youth need to contact OSF directly to request the sample collection kit. 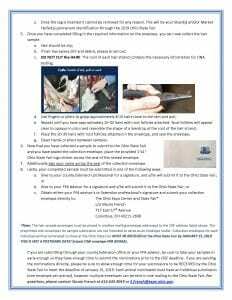 Attached is a document containing sample collection instructions. Please read the attached instructions that will be a part of each sample collection kit, and contact Stacey French, Agricultural Department at the Ohio State Fair, if you have any questions. Stacey’s phone number is 614.644.4049 and email is S.French@expo.ohio.gov. Also note that youth showing at any of the BEST sanctioned shows must have EID tags in their calves prior to the first show in which they exhibit. BEST shows prior to the January 15 deadline to submit samples to OSF include: Heart of It All, November 24-25, Lima; AGR Holiday Classic, December 8-9, Columbus; and Scarlet & Gray Midwest Showdown, January 5-6, Springfield. Successful Year for Greene County Youth at OSF! 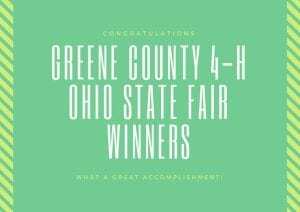 What a great year for Greene County 4-H youth at the Ohio State Fair for non-livestock projects. More than 75 youth were nominated by judges to represent Greene County 4-H in some tough competition with youth from around the state in many project areas. The individuals listed below received top honors of “Outstanding of the Day.” This honor is awarded to youth who place in the top 20% of their class. The clock trophy is awarded to the top in the class. Congratulations to all of our state fair delegates and way to represent Greene County! Congratulations to all youth who participated in pre-fair judging. We have a limited number of state fair parking passes and admission tickets. 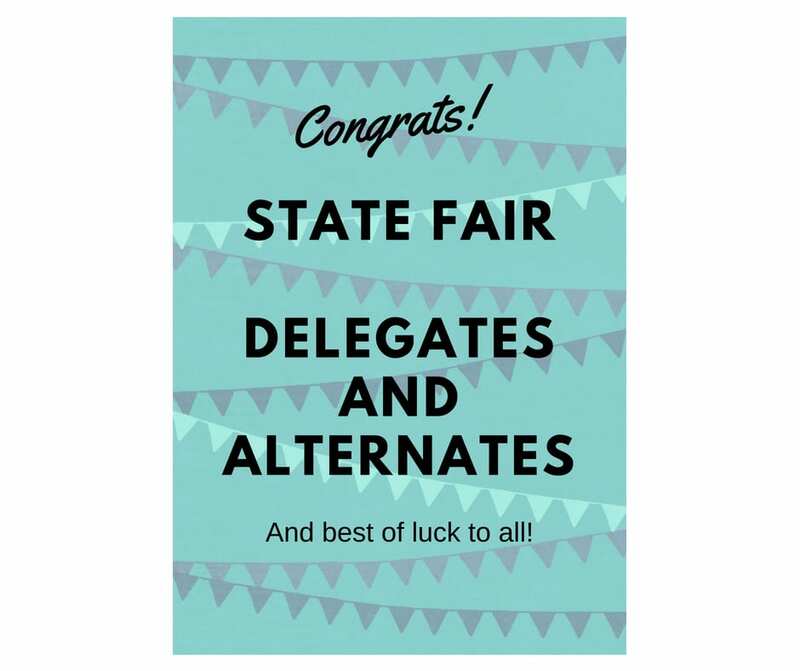 So, hurry in to pick up state fair packets! 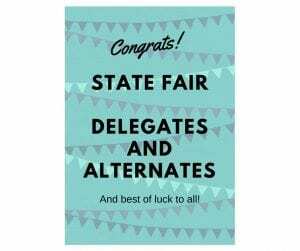 If you are a delegate and you know you will not be attending the Ohio State Fair, please let us know ASAP so we can contact the alternate. All information must be picked up by July 19! Congratulations and best of luck! Way to represent Greene County 4-H! Got talent? Check out this new event at the Ohio State Fair Youth Center. The event will be held Saturday, July 28 at 6:00 p.m. and is open to 4-H members only. Members have a chance to win a clock trophy! Spots are limited and applications will be accepted on a first-come, first-served basis, so register soon! Please go to ohio4h.org/ohiostatefair for the application to apply. Are you a 4-H member who has taken on leadership roles within your club? Have you taken a leadership project? Are you a camp counselor or a JFB member? Consider participating in Workforce Prep day at the Ohio State Fair. This event is so much fun! This event is held on July 29 and the Clock Trophy winner in each age division will win $250! If we can help in any way, let us know! Entries are due July 13! Have you thought about participating in our county demonstrations event? How about use the same demonstration you gave in your club? Or use it as a practice about what you learned in your project in preparation for prefair judging. Public speaking is such an important skill and this is a great way to practice and gain additional experience. 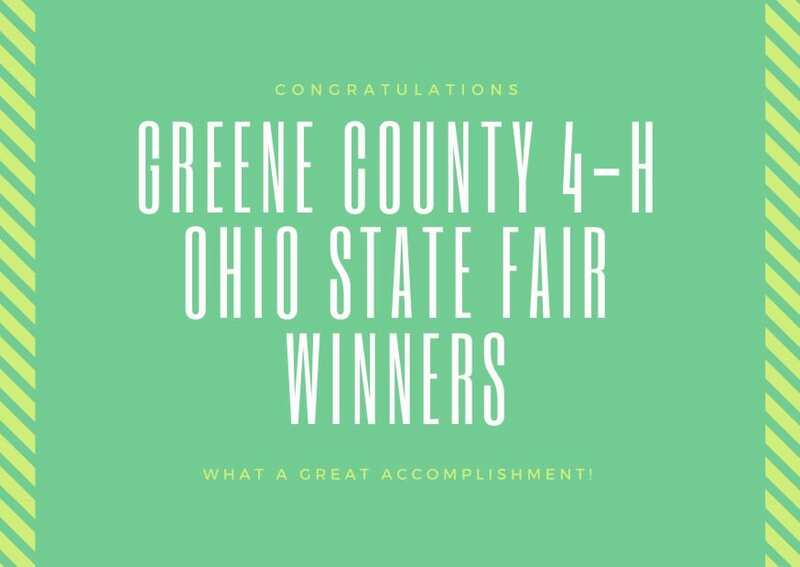 Youth will also be selected to represent Greene County at the Ohio State Fair. 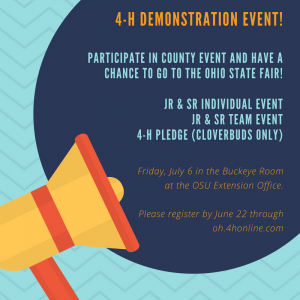 There are categories for individuals, teams, and for Cloverbuds for reciting the 4-H pledge. Greene County will follow these rules and specifics that are the same for the Ohio State Fair. Please click here. Please pre-register for a scheduled time by going to oh.4honline.com and register for an event!